Worms. The mere mention of the name conjures images of opposing teams employing an impressive arsenal of weaponry as they do their best to take each other out across a variety of colourful landscapes. The Super Sheep, Concrete Donkey and the almighty Holy Hand Grenade, at this point, are now infamous as potential tools of destruction. Yet whilst the series has retained its comedic nature and popularity, it became stagnated and unable to find a footing in pushing itself in new directions. 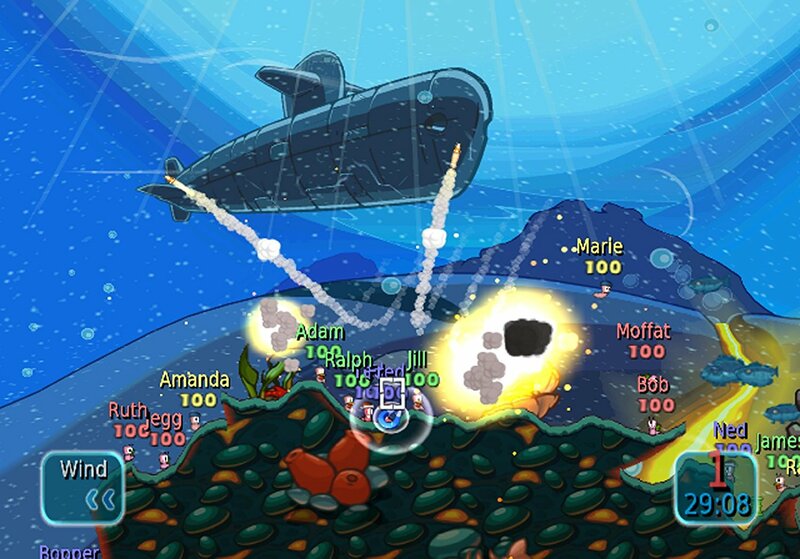 That’s where Worms Battle Islands steps up, introducing a few new elements and for the first time in the history of the series on Wii, players can engage in online multiplayer as they aim to climb their way up a tiered ranking system. As always, customisation continues to play a fundamental part within the overall Worms experience. Before you are even allowed to get going, you’re tasked with naming your team of intrepid worms and choosing your base of operations before you are able to dive into what the game has to offer. Optional tutorials are provided for those that haven’t played any previous entries in the series (although let’s be honest, who hasn’t?! ), and serves to take you through all the basics, including movement, weapons and key elements of the game such as Wind and Crates. Whether you choose to complete these or skip them completely, you’re immediately able to jump into a multitude of facets whether that be single-player Campaign or Puzzles, local Versus matches with up to four players, or head straight online via the Nintendo Wi-Fi Connection. Anything that you do within the game also provides you with experience points that are necessary to climb the ranks, unlocking further customisable content for you to gear up your Worms team with. Such items are mainly appearance based, yet allow an extensive degree of personalisation. Examples include Accessories, Backpacks, Gravestones, Flags, Victory Dances, and even the shade of colour that your Worms are! A highlight, of course, is the unlockable Speech Bank options that continue to add plenty of humour and diversity. 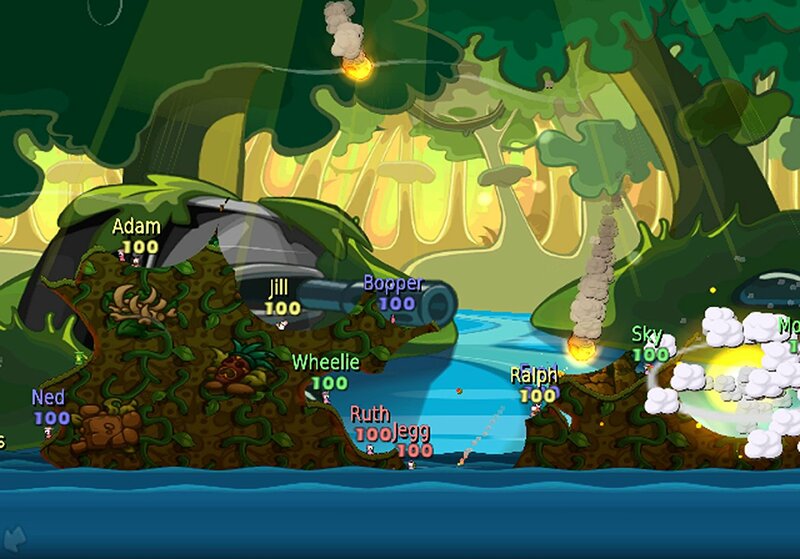 A central concept to this latest Worms outing is that each player is provided with their own Player Island. Here, you are able to continually able to expand your operational base with buildings that each grant a unique ability that may be employed within the War Room, a new addition to the series that may be utilised within the Tactics game mode or the core single-player Campaign itself. Battle Islands offers three control schemes with the default set-up seeing you hold the Wii Remote sideways, SNES style. Here, the Control Pad is used for movement, A for the Weapon Panel and B to adjust the Camera, whereas 1 allows you to Jump and 2 is used to fire whichever weaponry your worms are armed with. It is by far the most comfortable set-up on offer, yet for those looking for alternatives, a ‘Motion Sensing’ scheme alongside a ‘Nunchuk Style’ control method are also available. The former however doesn’t seem such a natural fit at all to the play style, and the latter isn’t that much better. Within the War Room, you are able to implement a range of pre-match decisions, whether it be choosing where your team is to be placed, stealing weapon supplies from the enemy team, or even sniping an enemy (or friendly!) worm to rob them of some health straight away. It’s an interesting addition, to say the least, yet one that initially didn’t seem to enhance or benefit the game. However, as the difficulty ramps up, or when you move to the online arena, the ability to gain minor advantages here and there begins to shine. Each level across the Campaign also provides the chance to collect Blueprint Crates, their purpose serving to allow you a greater degree of customisation options within the Weapon Factory. It is here that you are able to create Custom Weapons across Projectile, Strike, Explosive and Melee categories. As you collect more Blueprint Crates, the weapons that you will be able to customise will begin stronger, whether that be in terms of accuracy, size of the explosion, damage or force, or even as to whether ammo has a fuse, ignites on fire or scatters in a cluster. You’ll be able to make multiple weapons and choose to take one of them into either single-player or multiplayer modes to use. It’s a fantastic addition to the game, and you’ll have to weigh up just how powerful the weapons you create are – the stronger the weapon, the fewer chances you get to use it in-game. 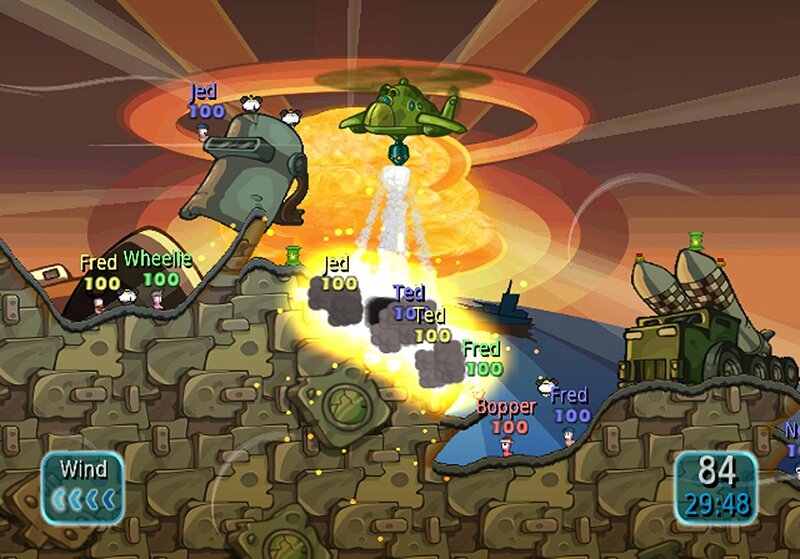 Multiplayer has always been a big attraction throughout the Worms series, and it retains just as much charm here. Local matches provide the opportunity for a group of players to either share an individual Wii Remote to play or use one each, as they are invited to compete across the games five modes; Deathmatch, Tactics, Racing, Forts, and Triathalon. Deathmatch is the usual affair, tasking players with eradicating the opposing teams, however, that which provides the hilarious results during group-based play is the Racing mode, in which opposing players take it in turns to speed their way around a landscape with either a Ninja Rope or Jetpack. It’s ridiculously amusing, and competitive. Further to this, Triathalon mixes both Deathmatch and Racing modes, leaving Tactics and Forts to entice the more strategic players amongst you. Tactics, as discussed previously, introduces the War Room and sees players trying to gain the upper-hand against each other pre-match. Forts see teams spawn on opposing sides of the landscape, where they must utilise the security their own Fort provides as they seek to accurately launch varying projectiles to take out the enemy team. Patience and careful aim are the key aspects here, and it makes for some particularly tense matches. Whilst filled to the brim with new content, the only issue here is that Worms Battle Islands doesn’t really do that much different from that seen before it. Yet that doesn’t necessarily mean that it is any less enjoyable. Although long-term fans may crave innovation for series, there is still plenty to enjoy here and should make a particularly welcome addition to any Wii owner’s stocking this Christmas.